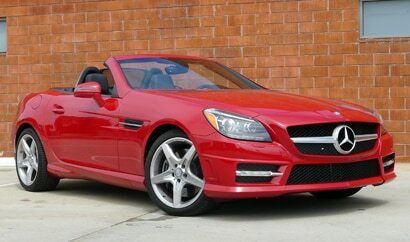 In short: A luxurious 2-passenger hardtop convertible. While the previous generation SLK failed to impress with its 185-horsepower 4-cylinder, the 2012 Mercedes-Benz SLK350 comes ready to play with a throaty 3.5-liter direct-injected V6 that supplies a healthy 302 horses. Inside the cozy yet comfortable two-passenger cabin, a booming eight-speaker audio system, Bluetooth audio streaming and HD radio provide the perfect soundtrack to your top-down travels.